Warning: There is not a final “after” of this Before & After post yet, but there will be soon. I spend a good bit of the weekend making over a friends bedroom. It’s been a while since I’ve done a major overhaul on a room and it was so fun to watch the progress! Here is her room before…. There is absolutely nothing wrong with it…she’s got all the essentials: pretty bed, seating, night stand, dresser/mirror, even a media center (that you can partially see on the right side of the photo). The furniture is really pretty in a dark mahogany color and the cute chair adds a little vintage touch to the room. You almost can’t tell in the photo but her bedding is a very, VERY light robin’s egg blue. It’s a very pretty color, but up against the almost empty beige wall, and the beige ceiling, and the beige carpet….well you get the point…it’s a little, dare I say, drab. 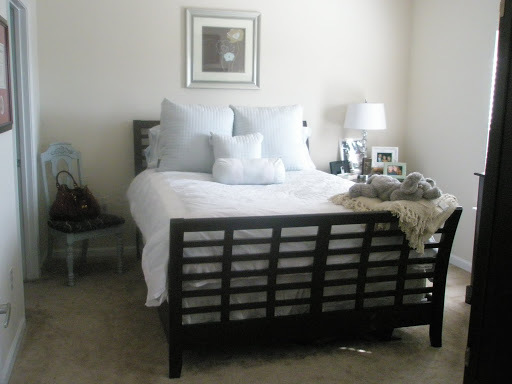 Haley was looking forward to creating a bedroom she could really enjoy! Something bright, and cheerful! When she she told me she wanted me to help, I was definitely excited. But when she told me she wanted to paint an entire wall green…..well, that’s when I really got into it. So, first stop was to order the bedding. Since she had a 10% discount for in-store purchases only, we went into the store and had them order it there. Even though it was ordered online, because we were “in the store”, the discount still applied! YAY! Also, if you live in the Birmingham area and need assistance at the Summit Pottery Barn, ask for Holly…she was awesome! 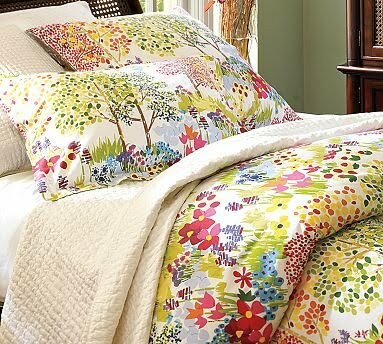 Using the bedding as inspiration, we headed to Home Depot for paint. She chose Behr’s “Granny Smith Apple Green”. We really made some progress…. And it finally turned into this…. The photo shows the wall looking a little on the lime side, but the paint dried to be a nice mossy, peridot color. And remember, that the new bedding will be here in just a few days. Then I will post the final “after”! Once the bedding is on, the room is going to have a fun, cohesive look! I’ll post the final results soon! Cheers to Haley and her almost made-over, cheerful bedroom!